Throw away that sticky pan and get the new GreenPan. 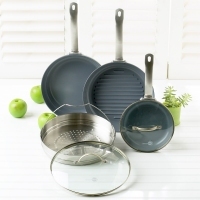 This 6-piece set includes an 8 inch fry pan with a tempered glass lid, 11 inch round grill pan with a tempered glass lid, 11 inch fry pan, and an 11 inch steamer insert. The environmentally-friendly GreenPan has a non-stick coating, making it healthier because you don’t need to add butter, fats, or oils. It even cooks at high temperatures without scratching or overheating, and best of wall you can stick it in the dishwasher. HSN.com, $99.90.